TK, if I were to make a guess as to the difference in serial numbers, I would guess that Washburn changed manufacturers. My Tacoma built D46 Cheyenne has a 4 digit serial, using Tacomas system. 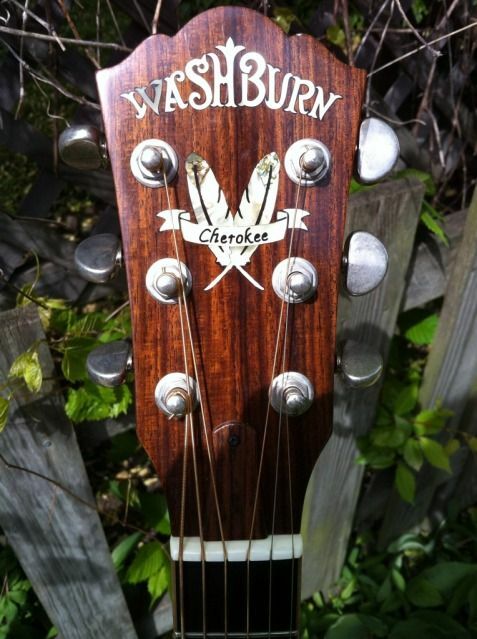 Some have posted pictures of their D46's that had the long serial numbers, after Washburn moved production from Tacoma. Of course, that's just a guess on my part. Looks like i just bought me an -83 vintage Washburn Force 4 bass. Going to be interesting to rip it apart as it shows up. I just had a long discussion with the luthier. I have been searching forums and ads and Wiki for weeks trying to make sure I got the right pickups for my J6 (it's expensive). Well it devolves down to this: IF you were designing the J6 today WHAT would be the right pickups. Well it comes to Seymour Duncan Seth Lover being a choice that is NOT WRONG..
OK dropped it off. $330 out the door -- new SD Seth Lover new covers all set up to spec. Done in about 3 weeks. so, bringing this back around...what do we know. Racing...do you believe that Uncle Mat made HB's for Washburn? Ever seen em? Ever heard your compadres talking about them? What about Yamaki? As to the serial numbers...the one facet that was intended to address this issue...there are 4 digit and 6 digit guitars. gitfiddle has a J6 which is VERY similar to mine in finish, with a 4 digit number, bought new in 88. 1984HB35 owns a guitar exactly like minewith a 4 digit number, and he's under the impression it's a Matsumoku. With enough input from owners, we should be able to start to narrow this down. so the question is, what was the system being used by Mat and Yamaki, is there any consistancy between styles and SN's?? 5 digit means itÃ‚Â´s a 70s issue,and the first digit denoted what yr.
80s are either 6 or 7. Would have been easy enough to state that they work the same way,but this is where I will cast my vote and say that is not always true. Of course the difference between the Yamakis and Mats,but thereÃ‚Â´s more to it than that. Thing is that some of the ravens dont. IÃ‚Â´ve even seen them sans serial completely-just with the Washburn logo engraved into the neckplate. So...honestly...i cast my vote as dunno. Take the Force4 bass i just bought. However,the first TWO digits are 83-which would be conclusive with when the bass i case was bought by Mike. A system iÃ‚Â´ve encountered on other Yamaki built guitars. Then...my BBR super tele,which i suspect to be Yamaki,that carries a serial that starts with a 5...and i absolutely guarantee that no other conclusions can be made from the serial. My old HM-5 same deal. As for if Matsumoku made HBs...again,your guess is as good as mine,but i for one would find it very plausible. Have in mind that it was until quite recently that the highend Wings were denoted as being Matsumoku....until the likes of G3H asf started pulling the numbers. I guess what iÃ‚Â´m saying is that between the two that we KNOW were in bed with each other through Washburn alone...chances are that they indeed were on other guitars than the Wings. Or,more to the point,most likely even. Please donÃ‚Â´t get me wrong here,cause personaly i couldnÃ‚Â´t give less of a flying who made what from that regard(player factor) as they BOTH made fantastic instruments. Ultimtely, I agree. I love my guitar. It's a great player, and I have no plans to part with it. As I said at the start of the thread, when dudes start placing price tags on them of a grand or more stating that are made by Matsumoku...well, I'm curious how that make that statement. Thanks for the input, Racing. Tio, A new HB-35 MIC OR MII list for almost a grand. I don't know about you but I wouldn't trade either of my HB-35's MIJ or MIK for a new one. I believe a grand is probably about the right price for the older HB-35's. Both of my HB-35's are good players and I am completely happy with them. I am not looking to sell but I would like to know the history. Here is an interesting article I found on Washburns, seems that they used a lot of plants in Japan. Might be,but the mention of Tarada,Ibanez(Greco-FujiGen Gakki) and Tokai hardly qualifys as conclusive. As far as i know for instance FujiGen landed their contract with Fender for the JV series in late 80. Ie;that done they hardly needed/could cope with more business. ..and nowhere is Matsumoku or Yamaki even mentioned. Got a feeling that article tells us about....nothing. Yes Racing, that was my point both Mat and Yam being large factories it is odd that they were not mentioned if they were building Washburn's. TK, I found an old post in the forum where someone has a D-28 with the serial# 36xx. Although that is an acoustic I am curious about that serial beginning with #3.
seeing that all the 4 digit serials I've seen are 8xxx, I wonder if he doesn't have a bad read on it, didn't print clearly etc, and that 3 is really an 8. Don't know if others saw the note, Rudy, who toured and chose the factories used in the 80's, just sold US Music (Washburn). I have a D46, Tacoma built, that has a 4 digit serial, and the first number is 3. What year is your guitar? I wasn't aware that Tacoma also used the 4 digit serial. Perhaps that is what the other guy has also.